(Text automatically translated) Beautiful apartment in the center of the tourist district of Little Venice, on the ground floor of an old house, with private courtyard overlooking the river Lauch. From the entrance, give the right bedroom (queen-size bed 160 cm) and bathroom (bath, toilet, washing machine). To the left, a first room with TV and view window on the court, and after three steps, a second living room with a sofa chair in a very good 1 single bed (80 cm), library and internet connection (cable or wireless) and finally, in continuity, a well-equipped kitchen (fridge / freezer, microwave, dishwasher). Direct access from the entry or the kitchen to the courtyard with a garden. The apartment set for 3 people, can accommodate a fourth, with a supplement of 35 to 55 euros depending on season. (Only child cot) Cleaning service available at end of stay for 50 euros. All shops, indoor market, caterers, restaurants. Start area not pay city parking within 50 meters. Sheets, pillowcases, towels, kitchen towels, vacuum cleaner and cleaning products are provided as well as a small "store" Troubleshooting. As other reviews have indicated, this is a wonderful property in a marvelous location. The lovely Brigitte and Christian met us at the train station, which is not a long walk from the Maison Bleu but since it was raining when we arrived, this was a real benefit! The location really can't be beaten. It's wonderful to be staying in one of the 15th-century Petite Venise houses that all the tourists are taking pictures of. There is a pretty fountain outside the front door and a canal behind the apartment, on which boats filled with tourists float by. Despite being right in the midst of things (two restaurants are right next to the apartment), it was much quieter than we expected, and felt quite private, which was very nice when we settled down in the garden for a glass of wine in the evenings. Brigitte and Christian were wonderful hosts, and even located a fan for us to use in the bedroom at night, since it was hot when we arrived. My wife and I had a truly magical stay here and would happily go back! MERCI mille fois pour votre gentille appréciation qui nous touche beaucoup ! A une autre fois peut-être ??? Maison Blue is a pretty, traditional home with a private courtyard overlooking the canal. Christian and Brigitte met us when we arrived and showed us round this well equipped and very comfortable apartment. It’s situated in the perfect position to explore Colmars old town and canals with it’s beautiful buildings, many restaurants and shops. It’s the ideal base to explore the Alsace Wine Route and surrounding villages, also it’s only a short drive to the Black Forest. All the comforts of home in the perfect location! La Maison Bleue, what a special place! You have at your disposal a fully equipped, ground-floor apartment in a historic building that is located at the edge of the historic center of Colmar, right on one of Colmar's beautiful canals. Plus, outside your apartment and along the canal you have your own backyard/courtyard space for eating, sunning, or just enjoying the flowers. The apartment is fully equipped with everything you will need to prepare your own meals, including necessary staples such as salt and pepper, cooking oil, coffee, and so on........(My only pet peeve was that there was no really sharp knife.) Plus, you even have a clothes washer and dishwasher at your disposal, should you need either. There is plenty of room for sitting and relaxing, watching tv, or taking advantage of the free wifi. The bedroom is sparsely furnished, but adequate and with a comfortable bed. The bedroom is, however, located on the street side of the apartment so noise from the street may be a bother to some; it wasn't an issue for us. Parking was/is a bit problematic, but available. The pay to park spaces in front of the apartment are generally available, but the maximum time for advance payment is two hours, thus you have to feed the meter several times a day; still not all that expensive and not a horrible bother, especially since there is no charge from 1200 until 1400. We were told that free parking can generally be found in the area for those who are diligent. Brigitte and Christian Kempf are perfect hosts; they meet you and explain everything, and then check to see you off when you leave. I might add that there is a very fine and reasonably priced restaurant and butcher shop right next door, and that there is a woderful boulangerie/patisserie around the corner. In essence, we simply loved La Porte Blue and thoroughly enjoyed our stay in Colmar. 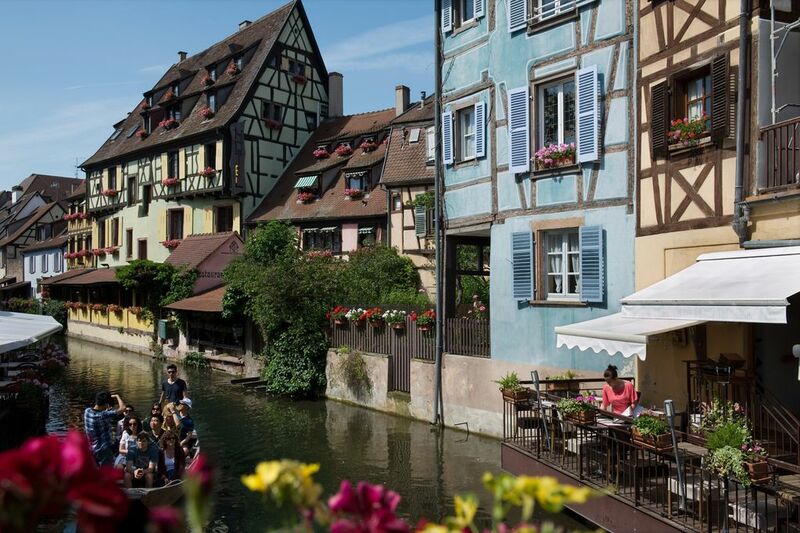 La maison bleue was the perfect place to stay in Colmar. Brigitte and her husband were present for our arrival, giving us a ride both from and to the train (equipped with a car seat for our two-year-old son). There were toys available for our toddler to play with, and the ground-floor apartment was easily accessible and safe for our son. They discreetly dropped off a second set of linens and towels halfway through our three-week stay and even included a second set of toys for our son to play with. When we left, Brigitte had knitted our son a hat and brought him a little fire truck to take with him. The apartment itself and comfortable and well stocked. It feels larger than it is and is divided well, complete with a private outdoor space with a little garden. We looked out the kitchen window to see swans, ducks, and fish in the canal in the mornings. Everyone stops at the bridge to see La Petite Venice, so you feel like you're the local and everyone else is passing by. The Covered Market (open Tues–Sat) was a four-minute walk away, and walking around the town itself was the best part of the trip. The little green train that tours the town is well-worth the 30-minute tour, and the local shopping is fun and charming. This place very quickly became a home away from home, we would gladly return. a great thank for your a big thank you for your kind and good appreciation of our apartment "de la maison bleue". The best of wishes for the future and much joy with your lovely Connor ! (Text automatically translated) You can view the access plan and the "Blue House" on GoogleEarth.